MikesXS.net was started in 2001 with the XS650 rider in mind and has continuously been the largest and most comprehensive supplier of XS650 parts. MikesXS carries everything you need to service your Yamaha XS650, including: high output XS650 charging systems (PMA kit), hard tail frames, big bore kits, XS650 petcocks, oem type oil filters, XS650 carburetor (carb) kits, brake calipers, clutch repair kits, XS650 master cylinders, gasket sets, 7/8 inch handlebars, cam chain guides and many other items! All of the inventory listed on our site is in stock and usually ships within 24 hours. We ship all over the world from the United States to Australia, New Zealand, Japan, UK, France, Germany and over 50 other countries. We are proud to have many of our parts manufactured for us by the very same factories that made the original OEM parts and we also support and carry parts from custom parts builders like Hugh's Handbuilt, Monster Craftsman, TC Bros, Pamco, XS Charge, Analog Cycles, Moto Gadget and many other custom motorcycle fabrication parts. The XS650 XS1 was the first 4 stroke engine motorcycle ever developed by Yamaha and was also the first large displacement engine. Prior to the introduction of this bike, the largest engine was the YR-1 Yamaha 2-stroke twin. 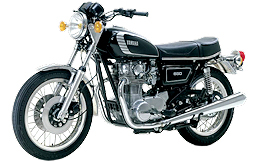 The XS650 debuted on the market in 1970 as the XS-1, the biggest bike in the Yamaha stable. Available in one color scheme, green and white, the first version featured drum brakes and was not equipped with an electric starter. The motorcycle division of Yamaha was founded in 1955, and was headed by Genichi Kawakami. Early success in racing set the tone for Yamaha, as competition in many varieties of motorcycle racing has been a key endeavor of the company throughout its history. The target for Yamaha therefore was clear: light weight, high performance and easy handling at a level of the smaller Yamaha two-stroke motorcycles. The high engine output of the SOHC compared to the existing OHV type four-stroke models. The Yamaha XS-1 650 is defined as a proven legacy and continued on through 15 years ending in 1984. One of the exciting emerging trends over the last years has been the ease in which the XS650 can be customized into a chopper, bobber, brat, cafe racer or you can just do a complete restoration. MikesXS has a very experienced team of professionals that can help answer any questions you might have on your custom project. "Brake Rotor - Drilled, Floating, 77-84 Front with Spacers"